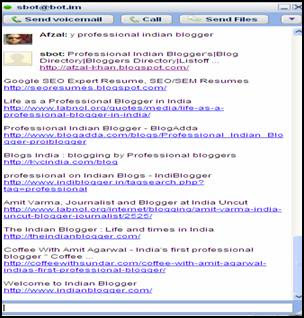 Search Google, Yahoo, Bing or Twitter Replies from your IM with "SBOT"
Do you want to check SERP's results without visiting Google.com, Yahoo.com & Bing.com or want to see your Twitter replies without opening all these search engine's and twitter site on your web-browser. "SBot" is a very handy and useful in terms of saving your loads of time, also it makes searching task lot easier by providing us with an option of not to struggle with multiple tab browser or hitting at Search Engine shortcuts on browser. On top 'SBot' is always available in IM to perform searches. 1. 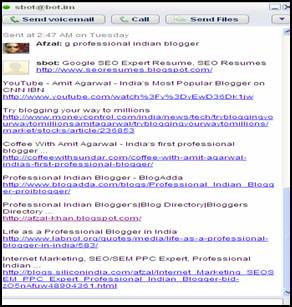 Add search bot "Sbot" to your IM's (G-talk, Yahoo messenger & MSN messenger), right now "SBot" supports searches for Google, Yahoo, Bing (MSN) & Twitter only. 2. To perform search using "SBot" here's the shortcuts which you need to use at respective IM's for your searches at G, Y & MSN. There are many more other ways to search results at Search Engine's without visiting them, I found Ann Smarty of SearchEngineJournal has written a great and interesting post on "3 Ways to Search Without SERPs" where we can learn more on other ways to check search results. Great post.. Moreover we had Google chrome too in the war of other web browsers..